Founded in 2012, Casumo was one of the first of a new breed of a casinos where the focus was on a fancy new buzzword called “Gamification”. Things which seems commonplace at many casinos nowadays, like leveling system and real time updated tournament, were far apart then. At Casumo, what matters is not the end result, but the journey. Casumo has a lot of small things which makes playing there feel like there is always something to do. Regular “Reel Races” as they call them, where everyone who opt in and play on a certain slot compete for a prize pool by getting the highest win times their bet. So no matter if you are betting large or small you will the same shot at the prize pool. There are also VIP races with higher prizes on regular occasions. Casumo has their own technical platform, which allows the possibility to get things done quickly if they need to change something, want to add a new Game Studio or have a great idea for a cool new feature for the players. In the past, they have been one of the most innovative companies in the industry. Casumo possess licenses in many jurisdictions and their technical platform and their brand has been praised and received awards by the Gaming Industry and Online Player Forums alike. Choosing to play at Casumo is not a hard choice. At Casumo, different countries receive different offers based on their currencies and legislation. We recommend you double check which offer is available to you when you click the link on the side. To give you a proper start of your stay at Casumo, they offer you bonuses on the first 5 deposits. Always watch out for terms and conditions, and they have somethings worth noting. Bonus can be forfeited at any time, and when playing with real money and bonus money, any winnings gets split according to the ratio. For example, if you have €100 real money and €50 bonus, a bet of €3 will use €2 real money and €1 bonus money. One thing which stood out is the very small and quite annoying to read Terms and conditions. The entire site is greyed out and Terms for the bonuses are presented in a small box in the middle of your browser. They should really make it easier to read the terms of their bonuses. Casumo has a large offering, with most of the large providers you expect to find at Online Casinos nowadays. Amongst others, you will find the MEGAWAYS slots, a range of slots where the size of the Reels change every spin and you can win tons of gold. With great potential, comes great risk, and these slots are not for the faint of heart. They can really make or break your bankroll if you are not careful. Some of the popular MEGAWAYS games are Bonanza, Diamond Mine and Who wants to be a Millionaire? 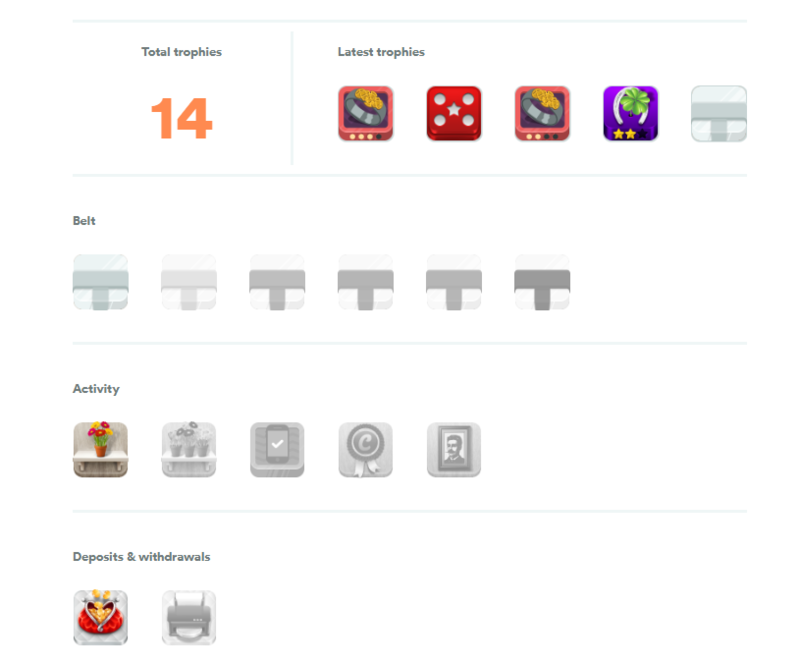 Grid slots, such as Moon Princess, Donuts, Reactoonz and Jamming Jars are getting more and more popular. Perhaps is it the Candy Crush generation which is now getting more into Slots and like this way of playing. Casumo has also recently launched the popular Red Tiger Gaming Must Drop Jackpots, where three Jackpots are available. Must Drop – This one must drop before it reaches €1000. 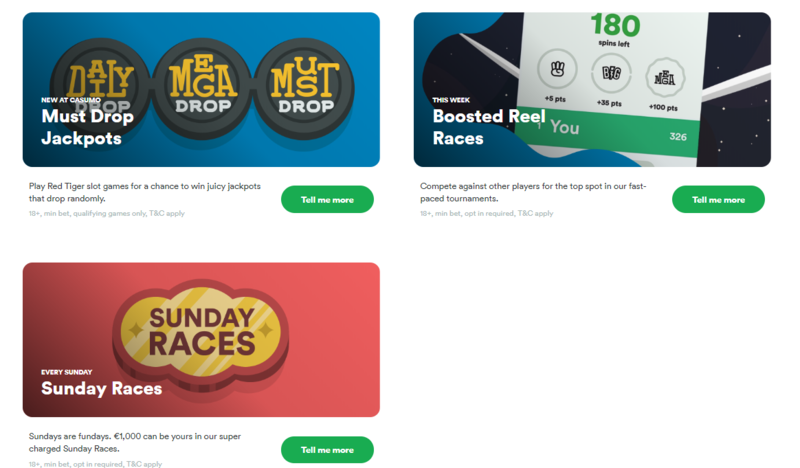 Mega Drop – This one is a “normal” progressive jackpot with a high payout. When it comes to the Live Casino, Casumo has tried to slim it down as much as possible. 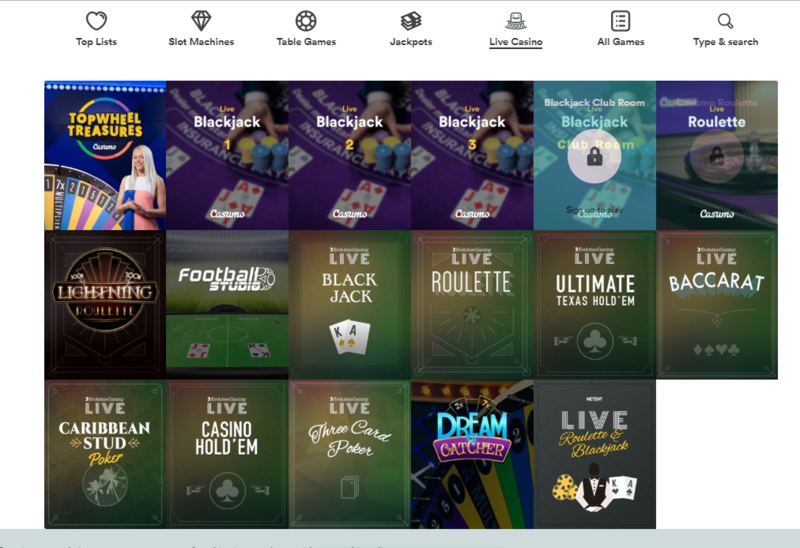 Instead of having 10+ thumbnails to different versions of Blackjack, Roulette and Baccarat, they have four Blackjack tables with Direct launch from the lobby, but then the rest of the thumbnails will take you to the lobby of each game, which in turn holds all of the different versions. Casumo also have their own version of the popular Dream Catcher game called Topwheel Treasures. Be sure to try it out and play only against other Casumo players at this exclusive version of Dream Catcher. 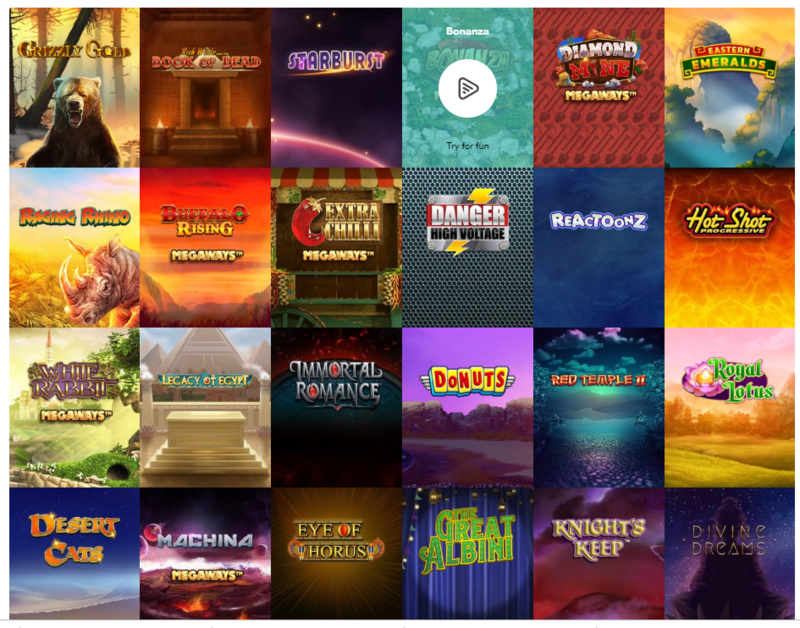 If the Wheel of Fortune style game is not your cup of tea, give Lightning Roulette a try, the exciting new Roulette where you can win up to 500 times you money on one number! If 35 is too low for you, go for Lightning Roulette. Outside of the welcome bonus and the reel races, there are a lot more things going on at Casumo. In your Trophy Cabinet, youn can see which trophies you have collected on your adventures. Things like “The Ring of the Rings” – received after winnings five times in a row on Hall of Gods, or the “Four-Leaf Clover” – which you get after winning 3 times in a row, 5 times. Under Valuables in your Account, Casumo shows you all of the things you have collected but not used yet, like bonuses, free spins and so on. Another good thing when you log in is the Dashboard you are presented with. It shows your latest game played, any current or upcoming Reel Races and other neat things you might be interested in just as you log in for the first time of the day. We give Casumo a strong 5 out of 5 stars. We at SlotMad really enjoying playing at Casumo every once in a while. Specially for the Reel Races which really gets us going.